With the tragic news that Bear Republic will cease distribution to Massachusetts at the end of the year, I figured I would stock up and get my reviews in while I still had time. Hopped with Chinook, Columbus, Centennial, and Cascade, this is one of Bear Republic's most well-known offerings. Pours just a lovely, hazy orange with two fingers of a frothy white head. The aroma is grapefruit, orange, lemon, and small hints of onion and garlic. Hops come through bright and clear. The taste leans more towards bitter hops and acidic grapefruit. Those garlic notes are more in-your-face, but it's not displeasing at all. The acidity of the citrus fruits is what appears to the most prominent. It's similar to biting into a freshly peeled orange right after brushing your teeth. Slightly mouth-puckering, but refreshing at the same time. Bitter hops linger on the back of my tongue and it finishes pretty dry. Racer 5 has a medium mouthfeel with good carbonation. The 7.5% is unnoticeable and this is a pleasure to drink. It's a shame Racer 5 will soon be gone from regular rotation in my fridge. It's a wave of juicy citrus and bitter hops that combine to make it great for those new to craft beer, but also pleasing to veteran beer geeks. 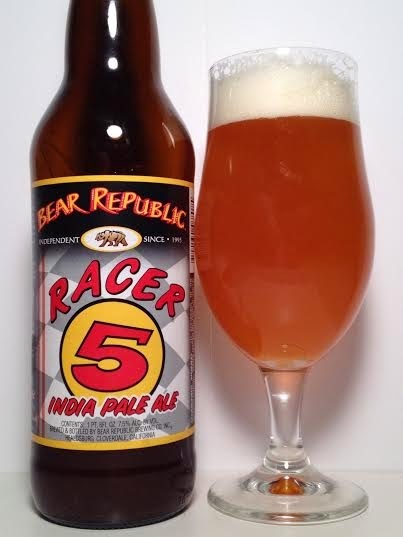 Sad to see you go, Racer 5, but I'll always have this last hurrah.